Original rolling stock at the original downtown local terminus of the 8th Avenue Independent Subway. Car R-1 381 and contemporaries are seen on a fan trip in 2004. Photo by David Pirmann. Saturday, September 10th, 1932 marked a major milestone in the continuing evolution of the New York City Subway. Without fanfare, or any major city ceremony, the Independent City Owned Rapid Transit Railroad (the Independent) opened at midnight that weekend. The man who put the entire idea into motion, former Mayor John F. Hylan, wasn't even in office to see his plan reach fruition. His successor, Jimmy Walker, resigned just a week before the IND opened for business because of charges of corruption. The current mayor, Mayor Joseph McKee, was unavailable. It was the last, great, major expansion of the subway to this day, and the event went relatively unnoticed by the City government. This article describes the history of the Independent Subway in the days of private operation and the IND Division after Unification in 1940. Around the time the Independent was first conceived, in 1920, there was severe overcrowding on the subways. They were victims of their own success. The word "unification" was very politically correct during this time. The idea behind unification was to have the City of New York buy out the privately owned Interborough Rapid Transit (IRT) Company and the Brooklyn-Manhattan Transit (BMT) Corporation. On April 25th, 1921, the New York Transit Commission was formed to develop a plan to resolve the overcrowding and delays on the current lines in any manner it saw fit, including "recapturing" existing lines from the privately owned rapid transit subway and elevated lines. Extending the BMT Broadway Line from 57th St./7th Ave. to 155th St./7th Ave.
A 4-track line from Washington Heights to Lower Manhattan. John F. Hylan was Mayor for two terms from 1918 to 1925. Legend has it that, as a young locomotive engineer for the Brooklyn Rapid Transit Company (BRT, predecessor to the BMT), he was fired because he exceeded the posted speed operating his train around a curve. He was studying for the bar exam while employed at the BRT. Once he was mayor, he was in a position of power to get even. He regularly made it difficult for the IRT and BRT to expand their lines or obtain funding (the 5 cent fare was a losing proposition and could not be changed without city approval). To get even with the private operators, he wanted a subway run by the city "independent of the traction interests". In fact, many of the lines the Independent opened were in direct competition with existing lines of the time, and those existing lines ended up being torn down in favor of the Independent lines. On August 28th, 1922, Hylan revealed his own plans for his subway system. His plan included "capturing" (or taking over) nearly 100 miles of existing lines and building over 100 miles of new lines. Construction of all these new lines would be completed by December 31st, 1925. Passengers would be able to ride between the ends of New York City on one fare. A West Side trunk line in Manhattan between 14th St. and the city limits at Yonkers. The line would be 4 tracks between 14th St. and 162nd Street, 3 tracks to Dyckman Street, and 2 tracks to the terminal. There would be a two-track spur from 162nd St. to 190th St. via Amsterdam Avenue. From 14th Street, the line would split - two tracks would connect to the BMT Canarsie Line and two tracks would continue south to a loop at Battery Park and an East River tunnel to Atlantic Avenue and Hicks Street, Brooklyn. Supposedly, there was also a plan of a line to Red Hook. A trunk line, 4 tracks, on First Avenue from the Harlem River to 10th Street. From 10th Street, the line would split. Two tracks would run via Third Ave. and the Bowery to a new Lafayette Ave. (Brooklyn) subway. The other two would run to a loop near City Hall. From the Harlem River, the line would run to 161st Street, the Bronx, and split into two 3-track routes: one to Fordham Road & Southern Blvd and the other to Webster Ave. & Fordham Road, where it would join the current IRT White Plains Road line and continue to 241st Street. Since this portion of the IRT El was already built to BMT clearances, and Hylan's system would consider using BMT clearances as well, all that would have to be done along this section is shave back the platforms. A line from 125th Street (near today's Henry Hudson Pkwy) crosstown, to and across the East River, to Astoria, Queens, likely connecting to the BMT Astoria Line. A new subway line, sometimes two tracked, sometimes four tracked, from approximately the Hunters Point Ave station on today's Flushing Line in Queens, heading in a southeasterly direction to Lafayette Avenue, Brooklyn. At Lafayette Ave, the line would split. Two tracks would turn into a four-track line along Lafayette Avenue. The other two tracks would run to Flatbush & Franklin Avenues. A 4-track subway line from Brooklyn's Borough Hall via the Lafayette Avenue subway to Bedford Avenue. From there it was three tracks to Broadway (Brooklyn) to Cypress Hills, where the line would continue on the present-day BMT Nassau Street-Jamaica Line. (The line would have ended at 168th St., where the Jamaica El once terminated.) The subway would have run directly under the El along Broadway giving it direct competition for passengers, and (in Hylan's opinion) draining revenues from the BMT. Two tracks of the Lafayette Avenue subway would connect with the proposed First Avenue line. A new IRT branch off the IRT's Eastern Parkway line in Brooklyn onto Utica Avenue, running under Utica to Flatlands Avenue. A 4-track subway under Flatbush Avenue in Brooklyn to Nostrand Ave, to Emmons Avenue in Sheepshead Bay, turning west onto Emmons Ave. to Surf Avenue in Coney Island. A branch of this line would head out to Floyd Bennett Field under Flatbush Avenue. Extension of the 14th St. - Eastern Line (today's BMT Canarsie Line) to the Jamaica El somewhere beyond 121st Street in Queens. A new line running from Prospect Ave., Brooklyn to Ft. Hamilton Pkwy., to 10th Ave., terminating at 90th Street. BMT Culver Line trains would use this line. Extension of the BMT 4th Avenue Line in Brooklyn, south to 96th St.
Extension of the 4th Avenue (Brooklyn) line east to the 10th Ave. line listed above and the BMT West End Line. A two track line from 67th St. / 4th Ave. (Brooklyn) to Staten Island. A branch off the IRT Corona Line to Jamaica from Roosevelt Ave. Date unknown but early photo of the IND 8th Avenue Line at 59th Street/Columbus Circle. Collection of: Joe Testagrose. The Transit Commission labeled Hylan's plan as ridiculous and, politics as they were in New York City at the time, there was no movement on the issue of transit overcrowding through the remainder of 1922 and all of 1923. Hylan also made sure that any remaining portions of the Dual Contracts that were still not built at the time ([[BMT Nassau Street-Jamaica Line||Centre St. Loop]], the Coney Island Complex, and completion of the BMT Canarsie Line (then known as the 14th St. - Eastern Line) would not get built during his tenure at City Hall. There was no way that he would spend City money for the private traction interests. During Hylan's second term in 1924, he again put forth plans for a new municipal subway. Senator James Walker sponsored legislation to abolish the Transit Commission and another bill to permit the city to borrow additional funds for subway construction. The legislation didn't go over very well, but a compromise was reached regarding abolishing the Transit Commission. A new Board of Transportation would be created to monitor Hylan's subway lines, and the mayor would appoint the board. The compromise allowed the existing systems to continue under the auspices of the Transit Commission, but the new city owned and operated lines would be built and operated under the auspices of the Board of Transportation. In addition, Hylan could not "recapture" existing lines with his new system - his system would have to co-exist with the current BMT and IRT lines. Finally, Albany made him run the city system at cost meaning eventually the Independent would have to charge a six, seven, even a ten cent fare to be profitable. On July 1st, 1924, the Board of Transportation was established. On December 9th, 1924, the Board of Transportation put forth its route plan. It differed slightly from Hylan's 1922 proposals in that there would be two trunk lines, one under 8th Avenue and the other under 6th Avenue, and the 6th Ave. El would be torn down once the 6th Avenue trunk line was built. The plans to extend IRT and BMT lines out to various areas of the outer boroughs were dropped. An 8th Avenue trunk line from 207th Street to Chambers St./Hudson Terminal. The line would run under the East River around the Wall St. area and continue into Brooklyn. There would be a branch off this line serving the Bronx running under the Grand Boulevard and Concourse, to 205th St.
A 6th Avenue trunk line from 53rd St. to W. 4th St. This line would turn east under Houston St. and run to 2nd Avenue. From there it would run under the East River into Brooklyn connecting with the 8th Ave. route. This East River tunnel would be near Rutgers Street. This line would continue through western Brooklyn to Church Ave.
A line running along 53rd St., under the East River into Long Island City, then via Queens Boulevard to Jamaica. On Saturday, March 14th, 1925, an official groundbreaking ceremony took place at St. Nicholas Avenue and West 123rd Street. Thursday, April 3rd, 1925 marked the real groundbreaking at St. Nicholas Avenue and West 128th St, where actual construction began. The City would build the line and lease it to a private operator. There would be no benefit to Brooklyn riders at all; congestion in Brooklyn would not be addressed. Crowding along the Third Ave El, the Pelham and White Plains Road lines in the Bronx would not be alleviated. The Independent's only line in the Bronx, planned along Grand Concourse, would alleviate congestion on the Jerome Ave line (although Hylan really wanted it torn down). Astoria and Flushing Line riders in Queens would see little relief from crowding. Connect the 8th Avenue line to the BMT Southern Division lines using a link from Wall or Fulton Streets to Chambers Street. Connections could be made with the south side of the Manhattan Bridge. Extend the 14th Street Eastern Line (the BMT Canarsie Line) to 8th Ave. This would relieve congestion at Union Square and allow north/south connections more easily. Build a four-track 3rd Avenue subway (IRT clearances) from City Hall to a connection with the White Plains and Pelham Bay Park lines. In the other direction, the line would run from City Hall to Wall Street, then across the East River to the IRT near Franklin Avenue. Have the IRT and BMT run joint service in Queens. Enable the use of steel cars by shaving the platforms back. Have the Second Avenue elevated come only as far as Queens Plaza, which will be a free transfer point to all lines. Creation of a four-track Brooklyn-Queens crosstown line designed for extension into Staten Island and the Bronx. (Where the line would extend to Staten Island is not known). Creation of a Queens subway line from Jamaica to 8th Avenue, Manhattan, facilitating transfers to the Brooklyn Crosstown line and to all north and south lines in Manhattan. It is interesting to note that some of Mr. Mathews' proposals actually were considered in later years, though not quite in the manner he laid out. He was also against the idea of two fare zones, where some people in the outer boroughs were required to pay to transfer to the other company's lines to get to and from work. He was ahead of his time; free transfers between divisions would wait until Unification in 1940. The Ashland Place Connection was not a project that was planned by the Independent. In fact, it wasn't even in John Hylan's first proposal. But it was planned by the BMT, and with John Hylan in office, any construction and expansion by any private rapid transit operator would be prohibited. The BMT was willing to fund and build this connection itself, but would not because the City would not complete the eastern portion of the BMT 14th Street / Eastern Line (today's Canarsie Line) and the Nassau Street Loop. This project was likewise affected, and had it ever seen the light of day, the subway as we know it today would have been very different. There may have been another elevated line in Brooklyn today called the Fulton Street El. The Ashland Place connection was a proposed linkup between the BMT Fulton Street El and the BMT 4th Avenue subway at Ashland Place. It would have alleviated some of the congestion of the BMT Southern Division through DeKalb Avenue; in 1924, the BMT Brighton, Culver and West End Els, as well as the Sea Beach Line and 4th Avenue Subway, all sent their 16 tracks into DeKalb Avenue. But only six tracks would come out -- two via the Montague Street tunnel to the BMT Broadway subway and four over the Manhattan Bridge -- two to the BMT Broadway Subway at Canal Street and two to the Centre Street Loop, terminating at Chambers Street. The BMT anticipated the City constructing the Nassau Street Loop, which would have eliminated the bottleneck at Chambers Street (and, therefore, DeKalb Avenue), increasing throughput by allowing additional trains to run into Broad Street. Since this wasn't happening, there would be no way that the BMT would built yet another feeder line into an already saturated section of the subway. Portions of the Fulton El were strengthened in anticipation of this connection being built, but it never happened. Had it seen the light of day, there may have been a three track elevated line along Fulton Street, or at the very least, some connection between the BMT and the Independent (as the IND Division of the NYC Transit System) at DeKalb Avenue. In 1968, the New York City Transit Authority opened the Chrystie Street connection, discussed further below in the history of the IND. Not only was it intended to unify the BMT and IND divisions, it was also meant to alleviate the same congestion the BMT was trying to address back in 1924. DeKalb Avenue (and the Manhattan Bridge) continues to be a source of congestion for riders of the BMT Southern Division, the Chrystie Street connection notwithstanding, to this very day. During the construction of the municipal subway, New Yorkers grew tired of Hylan's pontificating against the "traction interests". Hylan held the companies by their throats with one hand, while the other hand was screaming about the bad service, unbuilt lines, overcrowding ... giving him the chance to start up plans for a city system. The BMT argued that their service was bad because of City Hall, and people were beginning to take the side of the BMT. Jimmy Walker defeated Hylan in the mayoral election later that year. Unrelated to Hylan's goals, the South Brooklyn route was originally intended to run under the Gowanus Canal; it was later changed to run over the canal and to include a station at the top of the crossing at Smith & 9th Streets. This change was made for economic reasons - it was cheaper to bridge the canal than it was to tunnel under it. Work progressed throughout the latter half of the 1920s. Unlike the building of the IRT, which was, for the most part, manual labor, the Independent was built with more modern technology. If the equipment wasn't steam powered, it was either powered by compressed air or electricity. The creation of the Mack truck also made building the municipal lines "easier". It was predicted that this "Second System" would provide everyone in Manhattan, Queens, Brooklyn and the Bronx subway service within 1/2 mile of anyone's home. And there was a "third plan" that would be in the works, but not for another 10 years, that would extend subway lines to the City limits, as well as additional branches and feeder links to major trunk lines. (I have not seen anything related to this "third plan"). Some of the new lines proposed in the Bronx would make Bronx beaches more accessible. While the lines in Manhattan, the Bronx and Brooklyn would serve areas that already have some subway service, most of the Queens extensions were to areas that didn't have any subway service, and it was in these areas of Queens where the growth of New York City was expected to be the greatest. For the first time, the Independent would expand without competing with existing lines -- the only time in its history where this type of planning occurred. Speculation at the time was that construction could begin in mid-1930 and wrap up by 1940. Stations would be 700 feet long accommodating 12 car trains, and tile work would be more cheerful than the then-current construction; a special finish would be applied to it to more easily clean up the work of early graffiti artists (yes, there were some, on a small scale, in the late 1920s). A new line would start at Chambers Street, terminal of the 8th Avenue Subway, forming a "loop" subway that would head back uptown under 2nd Avenue. The "loop" would run from Chambers St to Water & Pearl Streets, then the Bowery & Chrystie Street, to 2nd Avenue all the way to the Harlem River. The "loop" would be 2 tracks at the southern tip of Manhattan from Pine St to Chambers St, and then would continue as 4 tracks to 61st St., 6 tracks to 125th St. and 4 tracks to the Harlem River. A connection from the 6th Ave. line at 52nd St. to 61st St. and Second Ave, 2 tracks. The Worth Street Line: This line would run via Church Street to the East River. A new river tunnel would be built and linked up with a proposed South 4th Street junction in Brooklyn. This line would contain 2 tracks. The Houston St. Line would be extended from Essex Street to the East River. A new river tunnel would be built and linked up with the same South 4th Street junction as the Worth Street line. This line would contain 2 tracks. The unusual layout of passageways at East Broadway was done in anticipation of this subway line being built. Boston Road Line: From the Second Avenue Line, starting at Alexander Avenue, via 3rd and Melrose Avenues to Boston Road in West Farms. This line would be 4 tracks to Boston Road at the junction of that thoroughfare with 163rd St. and Third Ave. The line would continue with 2 tracks along Boston Road to 177th St. At that point the subway would emerge onto an El, continue through the 180th St. yard, and use the White Plains Road Line, which would be "recaptured" by the City and modified for Independent system operation. 163rd St-Hunts Point, Lafayette Ave. (Bronx) Line: 2 tracks branching off the Boston Road trunk line, via 163rd St to Hunts Point and Seneca Avenues. From there, it would run under the Bronx River to Lafayette Ave and run along Lafayette Ave to East Tremont Ave. at East 177th St. This would include a transfer with the Pelham line at Hunts Point Avenue. The line would be 2 tracks. The Concourse Line would be extended from 205th Street, from Webster and Burke Avenues to Baychester Avenue via Boston Road. The line would be 2 tracks. It would include transfers with the White Plains Road line at Burke Avenue as well as the Morris Park -- Wilson Ave line at Boston Road. In anticipation of this section, the Concourse line turns east before terminating at 205th Street. Morris Park Avenue-Wilson Avenue Line: 2 tracks northeasterly along Morris Park and then north along Wilson Avenue to Boston Road to meet the Concourse Line extension and continue to Baychester Avenue and Boston Road. The Liberty Avenue Line: Extension of the Fulton Street line, then under construction, from Eastern Pkwy/Broadway Junction along Liberty Avenue to about Wyona Avenue, then along the BMT Liberty Avenue El from Grant Avenue to Lefferts Blvd (which would have been "recaptured"). It would continue via Brinckerhoff Avenue and Hollis Avenues all the way to Springfield Blvd., a distance of 8.5 miles. The line would have run as a 4 track subway to Grant Ave, 3 track elevated to 180th St., and 2 track elevated to Springfield Blvd. There would have been a short 2-track spur running along 180th St. and then Jamaica Avenue to connect to the end of the Jamaica El at 168th St. In addition, there would also be a connection to the proposed Hulban storage yard. Winfield Spur: This was designed to provide through service to the Rockaways from midtown, and also to serve the neighborhoods of Maspeth and Ridgewood. It would have been a two-track line from Roosevelt Avenue to a connection with the Central Avenue line outlined below. It would have run as subway to 45th Avenue, elevated to Fresh Pond Road, and again as subway to the connection with the Myrtle/Central Ave line. In anticipation of this line being built, trackways measuring 750 feet along with a completed station with full tile work were built that connect to today's IND Queens Blvd line at Roosevelt Avenue -- Jackson Heights. The area is now used for storage and maintenance-of-way offices. 120th Avenue Line: Connecting to and terminating at the Rockaway Line at North Conduit Blvd and Hawtree St (roughly today's Cross Bay Blvd), this line would run east along 120th Avenue and then Springfield Blvd. to Foch Blvd. It would be 4 tracks to Van Wyck Blvd, where a transfer to the Van Wyck Blvd line could be made, and 2 tracks to Foch Blvd. This entire line would be elevated. Van Wyck Boulevard Line: Utilizing the track connection later taken by today's Archer Avenue Line (this point was known as the "Van Wyck stub"), this would have run as subway to about 166th Avenue, then as elevated to its junction with the 120th Avenue Line at Rockaway Blvd. This line would have been 2 tracks. Flushing Line Extensions: Two extensions of the Flushing Line were proposed, both starting from Main Street. The first was an extension along Roosevelt Avenue (in 1929 called Station Road) to 155th St as a subway, then as elevated above the LIRR Port Washington ROW to 221st St. and 38th Avenue. It would have been 3 tracks to 147th St., then 2 tracks to 221st Street. The second extension would have branched off at 147th St. and Roosevelt Avenue and run via 147th St to 11th Ave, and then via 11th Ave to 122nd Street in College Point. This extension would also be 2 tracks, as subway to 35th Avenue and as elevated to its terminal. Astoria Line Extension: This would have curved east along Ditmars Blvd., Astoria Blvd., 112th St., and then diagonally across intervening streets and the Flushing River to Nassau Blvd. for several miles to Cross Island Blvd. It would have been two tracks to Astoria Blvd., then 4 tracks to Parsons and Nassau Blvds, and then 2 tracks to its terminus. The entire line was planned to be elevated, but the idea of constructing it as an open cut in parts of Nassau Blvd was being considered. The Myrtle / Central Avenue & Rockaway Line: From Stuyvesant Avenue, where the Utica Avenue Line would turn south, this line would continue east as a subway along Myrtle and Central Avenues to about 73rd Place, where it would emerge and then follow the LIRR Montauk Division. It would have continued to the LIRR Rockaway Branch and then turned south through Forest Park at 98th St, and continued south to Jamaica Bay. It would have been 4 tracks to Howard Beach, then 2 tracks to Hammels Ave in the Rockaways. It would then cross Jamaica Bay and the islands paralleling Cross Bay Blvd to a point on the Rockaway peninsula near Hammels Avenue and Beach 83rd St. The line would have gone to Beach 149th Street to the south via Rockaway Beach Blvd and Newport Ave. It would have extended to the north to Mott Avenue via Rockaway Beach Blvd. The portion of the line in the Rockaways would have been 2 tracks. The line from Central Avenue into the Rockaways would have been a separate right of way from the LIRR, which already had a similar service pattern, even though the LIRR's Rockaway Line was built with rapid transit service in mind. South 4th Street-Utica Avenue Line: Starting from Essex Street along the Houston St. line in Manhattan, this line would run under Houston St and the East River to Grand Street in the Williamsburg section of Brooklyn. It would then run to the proposed South 4th Street junction, then along South 4th Street and Union Ave to Beaver Street. From there, the line continues to Stuyvesant Avenue, then finally to Utica Avenue at approximately Fulton Street. The line would run under Utica Avenue to Ave I as subway, then become elevated at Ave J and continue to Avenue N. It would then curve southwesterly to Avenue S and make its way to its terminal at Nostrand and Voorhies Avenues in Sheepshead Bay. The line would be 2 tracks to Driggs Ave, 4 tracks to Ave S, and 2 tracks to the Voorhies Avenue terminal. This last section, however, would be built in such a way that 2 additional tracks could be added later. In anticipation of this line being built, a four track "station" was built the width of the Fulton Street line at Utica Avenue, so when construction for the Utica Avenue line would proceed, service on the existing Fulton Street line would not be disturbed. The Worth Street Line described above would also enter the South 4th Street station facilitating transfers with the Utica Ave line. It would run along Worth Street, East Broadway, Grand Street (Manhattan) and under the East River to Broadway in Brooklyn. The portion of the line between South 4th Street and Bushwick Ave would be shared with the Utica Avenue line, and was proposed to be 8 tracks in this section! This line would continue into the Myrtle / Central Ave & Rockaway Line at Beaver Street, whereas the Utica Ave line would turn south. In anticipation of this and the Utica Ave lines being built, portions of this junction with the Brooklyn - Queens crosstown line, as well as the South 4th Street station, were built, but were then forever sealed up. IRT Nostrand Ave. Line: A plan to extend the IRT Nostrand Avenue Line as a 2-track subway to Kings Highway, and then as an El to meet the Utica Avenue Line at Avenue S was also included. There was no provision for a subway line to Staten Island in this plan, but there were two proposed vehicular tunnels: one connecting Queens and the West Side of Manhattan at 38th Street and the other at approximately the same spot where the Verrazano Narrows Bridge stands today. Joseph McKee, president of the Board of Alderman in 1929, was not in favor of the elevated portions in the outer boroughs. He felt it would depreciate property values and slow business and residential development, and used the IRT Jerome Ave El as an example. He felt the Els would have to be replaced later on; they were a menace to traffic. Never mind that the cost of an El was estimated to be that of a new subway. It turned out that building an El doubled land values, but a subway would increase land values from 4 to 12 times! The Board of Transportation map that listed these routes was created on August 23rd, 1929. American Car & Foundry-built R-1 number 107, being delivered at 207th Street Yard in August, 1931. Ed Watson/Arthur Lonto Collection. In late April of 1930, the 8th Avenue trunk line was nearing completion, and the contract for the municipal subway's rolling stock was awarded to the American Car and Foundry Company (ACF) of Berwick, Pennsylvania. The contract number was R-1, and to this day, new contacts for rolling stock have followed this nomenclature. The "R" stood for "revenue", "rolling stock" or "rapid" depending on whom you speak to. 300 cars measuring 60 feet 6 inches long by 10 feet wide would ply the rails on this and other lines (of the IND and BMT divisions) until March 31st, 1977! (By 1940, over 1700 similar units with contract numbers R-4, R-6, R-7 and R-9 (see The Independent Fleet (1932-1939)) would be running, built by ACF, Pullman Standard and Pressed Steel. In addition, the length of the R1-9s, 60 feet 6 inches, is exactly the same measurement as the distance between the pitcher's mound and home plate of a Major League baseball field.). John Madison, a former IRT designer, designed the R-1s. Various studies had been done to determine the "optimal" type car for minimizing station dwell time. With the success of the BMT's [The BMT Fleet (Elevated, Subway, Experimental)|D-type Triplexes]], articulation was considered for a while because of its economies (two bodies sharing one truck) but in the end, articulation was not chosen. Instead of one larger side door opening in a single frame on each side, two side doors, half the size, slid open in one frame. This has been the standard on nearly all car orders ever since. The R-1s were tested on the BMT Sea Beach Line from July 8th to November 27th, 1931. The tests were successful. As opening day drew nearer, a full schedule of trains began running. The schedule called for a 4-minute headway during peak hours and an average of an 8-minute headway during off-peak hours. Expresses would run from 5:40am until 1:38am the next morning. The last express would leave Chambers St at 1:38am; the first morning express would leave 207th St at 5:40am. The express run from Chambers St to 207th St would be 33 minutes; the local from Chambers to 168th St would be 35 minutes. Although platforms would be built to handle ten-car trains, the first express trains to run on the Independent would be six cars; the first locals would be five cars. There were 482 trains planned per day; 228 locals from Chambers to 168th, 280 expresses from Chambers to 207th and 24 locals from Chambers to 207th. On September 8th, 1932, the only "official" act of the "opening ceremonies", an inspection train, was due to leave Chambers Street at 3pm. Joseph McKee (now the Mayor of New York City) was asked to ride the inspection train. He said he could not due to "official business". The Board of Transportation was willing to change the time of departure so the Mayor could attend; the mayor's office indicated that he was not available that entire day. The two other privately owned subway systems, the Brooklyn-Manhattan Transit (BMT) and Interborough Rapid Transit (IRT) companies were publicly skeptical but privately concerned that the city would make a go of the Independent. At a cost of $191 million, the Independent was designed not only to compete with them, but also to link up with them, especially the BMT, since it shared the same specifications. Also by this time, the public had been hearing the trains rumbling beneath them running simulated schedules, but not taking on passengers. At 59th Street / Columbus Circle, a large crowd of the curious broke through the barriers that labeled the system as closed to get a better look. Some of the curious brought pencils and pads with them; it made them look more official. It was a good thing, too; the police summoned to clear the crowds didn't bother with them, thinking that they were Independent personnel doing last minute inspections of the line! The new subway required 1,000,000 cubic yards of concrete, enough for a highway such as the Bronx River Parkway (in 1932) from the City to Albany. 150,000 tons of steel was used, or three times the amount required to build the Empire State Building. The roadbed of the new subway was expected to last 30 years. Just like the opening of the IRT, where on opening day there was a report of a crime, there was also some vandalism on the Independent's opening day. Vandals "broke into" some of the uptown stations and clogged turnstile slots with gum and other objects. Two months after the Independent opened for business, exits at 95th St, 97th St and 105th St were closed due to theft. In 1933, the Independent would also see extensions into the Bronx (205th St. and Bainbridge Avenue) and Brooklyn (Nassau Avenue as well as Church Avenue & McDonald Avenue). Smith / 9th Streets in Brooklyn would become the subway's highest station, at 87.5 feet from street level. On February 1st, 1933, the Independent terminated at Jay Street, Brooklyn. On March 20th, this line was extended to Bergen St. On July 1st, the Concourse Line opened from 145th St. to 205th St. After traveling north on the Grand Concourse, it turned east because plans saw this line extended to Gun Hill Road. On August 18th, the Queens Blvd line opened as well as the Crosstown line to Nassau Avenue. Finally, on October 7th, the South Brooklyn Line (also known as the Smith St Line) opened as far south as Church Avenue. Because of financial troubles, which became political troubles, there was no further Independent expansion in 1934 and 1935. Federal funding was finally obtained and construction resumed. On January 1st, 1936, the subway along Houston and Essex Streets (connecting West 4th St with Jay Street) opened. On April 9th, the Fulton Street line opened from Jay Street to Rockaway Avenue. At Nostrand Avenue and Fulton St, provisions were made for a connection to the proposed Bedford Ave line. At Utica Avenue, provisions were made for a transfer to the proposed Utica Ave line. The Queens Blvd Line was extended to Union Turnpike on December 30th, 1936, and to 169th St. - Jamaica on April 24th, 1937. The Brooklyn Queens Crosstown line was extended to Hoyt-Schermerhorn Streets on July 1st, 1937. On August 28th, 1939, the 23rd St / Ely Avenue station opened on the IND Queens Line. On May 26th, 1937, the Board of Transportation announced that the Court Street Shuttle would be closed (but it was not actually closed until June 1st, 1946). And the original plans that became known as the IND Second System were continuously scaled back due to growing expenses. The Independent's marvelous engineering, flyover junctions, provisions for future expansion and complex terminal facilities came at an enormous price--at the time of Unification, City taxpayers had invested approximately $400 million in the IRT and BMT systems combined. But they had invested $750 million in the Independent! This reflected dramatically in the debt service for rapid transit paid by the City. From 1919 to 1926 the average debt service for rapid transit was $9.62 million per year. From 1927 (when Independent debt began to be serviced) to 1944 this averaged $37.82 million per year! Part of the difference (between the BMT/IRT and the Independent) reflected the enormous inflation during World War I (for the Contract I and II lines and other city-financed construction before World War I) but even more reflected the fact that the City spent freely on its own system with the taxpayers' money and without the considerable contributions of the private companies. So looking only at the financial constraints on building a second Independent system, the City was ill-prepared to acquire enormous additional debt at a time when it was beginning its long upward spiral of social service spending. Of the routes approved by the Board of Transportation in the 1920s, only the 6th Avenue trunk route was still unfinished as of 1937. There was good reason - this line would have to tunnel over or under an aqueduct, the BMT Broadway Line, the Long Island Rail Road and Pennsylvania Railroad in the vicinity of 34th St, the Hudson & Manhattan Railroad (also known as the Hudson Tubes, and now called the PATH), the IRT Flushing Line, and the 6th Avenue El. In 1935, the city reached an agreement with the Hudson and Manhattan to relocate its midtown terminal to 33rd Street and close the 28th Street station. The original plan for the 6th Avenue line was to use the H&M tracks as the local tracks, and build two new express tracks between 8th St. and 33rd St. It didn't happen; the H&M was built to IRT specifications, and it would cost too much to retrofit the existing tunnels. Instead, the 6th Avenue line would have two tracks straddling the H&M from 8th Street to 33rd Street and express tracks would be built later. Construction began on March 15th, 1936. During construction, streetcar service along 6th Avenue was terminated, with the city having the option to restore it upon termination of construction, or outright abandon it. The city wanted to tear down the 6th Ave. El right away and save on the costs of shoring it up while construction proceeded underneath it. Two years later, after much wrangling, the city bought the El from the IRT for $12.5 million and terminated operation of it on December 5th, 1938. Its remnants were sold to Japan. The 6th Avenue trunk line, consisting of two tracks, opened for business on December 15th, 1940. It would be 28 years later that full express service would begin under 6th Avenue. R-9 series train at the World's Fair station in 1939. George Conrad Collection. About 6 months before construction began on the 6th Ave. El, on September 22nd, 1935, an "announcement" was made that New York City would hold a World's Fair in 1939, an idea that became very popular very quickly. The Fair would be held in Flushing Meadows Park, a swampy marshland used as a deposit site for coal ashes. But its proximity to transportation was what got the location sold on the City - the LIRR nearby, the jointly run IRT/BMT line to Main St. (now the IRT Flushing Line), Flushing Bay for boat access, the Grand Central Parkway for auto and bus access, and Flushing Airport for air travelers. And, as luck would have it, the IND was being extended to 169th St, Jamaica, and would be opened by 1937. On the southern fringe of the park, there just "happened to be" the Jamaica Yard, planned even before the idea of a World's Fair took shape. In early 1938, construction on the "World's Fair Railroad" began. It would run from the Queens Blvd. portal at Jamaica shop, along the eastern edge of the park about 2 miles to approximately what is now the intersection of the Long Island Expressway and the Van Wyck Expressway. Local stops were considered along the new route, and indeed had these been built, perhaps the line would have become permanent, but as constructed, it was a non-stop ride to the Fair. The line consisted of two tracks ending in a stub-end terminal with two tracks and three platforms. It was built on a wooden trestle across the marshy swampland, which was then filled in. The World's Fair Railroad ran test trains on the line starting April 22nd, 1939, and a full schedule was simulated the day before the Fair opened. On April 30th, 1939 at 10:56AM, the line opened. The GG provided the bulk of the service between Smith/9th Streets and the Fair, and at the close of the evening rush hour, it was augmented by E express service between the Fair and Hudson Terminal. Service generally ran until 1:00am. The 1939 World's Fair had one season in 1939, before unification, and one in 1940, after unification. BMT and IRT-issued maps to the Fair were plentiful in 1939, but non-existent in 1940. The World's Fair Railroad did not run at all between seasons, and at the close of the Fair, the line was to be demolished. The last train ran on October 28th, 1940 and on January 15th, 1941, demolition of the line began. Hindsight being what it is, the spur could have served another World's Fair in 1964 and 1965, at the very same location! It may have also been used to provide new service to a new Ebbets Field that was also proposed near that site in the '50s. But instead of rebuilding the World's Fair Railroad, rapid transit was decisively out of vogue in the '50s and '60s. Well after the 1939 - 1940 World's Fair, the city began many road improvement projects and one of these proposals, a $40 million northern extension of the Van Wyck Expressway, was built between 1961 and 1963 on the former right of way of the World's Fair Railroad. And as to the Ebbets Field proposal, legend has it that former Dodgers owner Walter O'Malley was a proponent of subway/trolley service to Ebbets Field, but parks commissioner Robert Moses wouldn't stand for that, and they never saw eye-to-eye. In 1955, the City, in an 11th hour bid to keep the Dodgers in Brooklyn, proposed the reconstruction of the Flatbush Avenue LIRR terminal and IRT subway station as a major transportation hub, but it wasn't successful. In late 1939 and early 1940, unification negotiations continued in earnest. The IRT was bankrupt and the BMT, while still afloat, was not what it once was. Nearly 15 years after John Hylan's administration ended, his wish came true, but he was not alive to see it; Hylan died in 1936. Unification of the privately owned transit lines with the Independent System occurred in June of 1940. Municipal operation of the BMT started on June 1st, 1940; it would complete with the IRT takeover on June 12th. As part of the Unification deal, the BMT Fulton Street and 5th Ave Els, and the Broadway Ferry portion of the Broadway/Brooklyn Els would close forever. The Fulton Street El made its final run on May 31st. The last train left Rockaway Avenue, Brooklyn at 10:49pm, stopping only at Borough Hall to pick up an official party, then ran to Park Row. Mayor LaGuardia, his official party, members of the Board of Estimate, City Council, the Board of Transportation and the Transit Commission boarded at Park Row. Then, the train left Park Row shortly after 11pm. As the last train traveled through stations in Brooklyn, station lights were dimmed in memoriam. There was no official trip for the 5th Ave El; there was a funeral procession for this El consisting of 300 city workers that took part in a motorcade that traveled along the route. The first municipally operated BMT train left Times Square at 12:08am with Mayor LaGuardia and officials of the BMT, Board of Transportation and Transit Commission. It ran to Canal Street. LaGuardia boarded at 57th St/7th Avenue and ran the train to Times Square as the symbolic "last privately owned BMT train" to run in the City of New York. Later than day, ceremonies marked the transfer of Contract 4 (dated March 19th, 1913) back to the City, as well as the signing of a "closing agreement". With these ceremonies, the City also took over the Williamsburgh power plant, 293 miles of subway and elevated trackage, 437 miles of street railway and 239 miles of bus routes. The mayor's remarks were broadcast over city-owned radio station WNYC. Regarding the IRT, as part of the Unification deal, the 2nd Ave El north of 59th Street and the 9th Ave Els in Manhattan would close forever at 12:01am on June 12th, 1940. There were no special ceremonies held for the closing of these lines, even though the 9th Ave El was the first elevated rapid transit line in the world, starting service on July 1st, 1868 between Cortlandt Street and Battery Place. The last train on the 9th Ave El, a 7-car train filled with 500 people, left South Ferry at 11:14pm, arriving at 155th Street at 12:06am. The last train on the 2nd Ave El, a 3 car train filled with 150 people, left South Ferry shortly after at 11:16pm, arriving at 129th St at 11:51pm. With the 6th Ave El having been torn down as a result of the building of the Independent's 6th Ave subway, only the 3rd Ave El remained in service. Free transfers at 155th St, Manhattan, and 161st St in the Bronx, were made available to the Independent's Concourse line. The only remaining portion of the 9th Ave El, the "Polo Grounds Shuttle" to Burnside Ave, closed for about 1 1/2 hours at the close of 9th Ave service, to "prepare" this portion of the line for its new service pattern. The Els were torn down because the city felt the Els would run under a huge deficit, and they could not afford that. With the Independent subway providing redundant service nearby, there was no need for the elevateds anymore. The 3rd Ave. El survived until May 12th, 1955, because the intent was to replace it with the Second Avenue subway, proposed back in 1929. On June 12th, 1940, municipal operation of the IRT commenced. The 2pm ceremonies at City Hall saw former Mayor James Walker in attendance. The ceremony basically was the surrender of Contracts 1, 2 and 3 to the City. LaGuardia called Contract 3 (the contract specifying the 5-cent fare) "the most famous football in history". He couldn't find "the father of the 5 cent fare"; no-one was willing to admit, or knew, who's idea it was. Not everyone was unhappy to see the Manhattan Els go. The West of Central Park Association held a reception at the Hotel Empire at 63rd St in honor of razing the 2nd Ave El. A party celebrating the razing of the 9th Ave El was held at the American Woman's Club on 57th St, celebrating the "silence" after midnight. Exactly two years after Unification of the IRT, its 2nd Ave El closed completely between Chatham Square, Manhattan and Queens Plaza on June 13th, 1942. The last train left South Ferry at 9:41 pm and arrived at Astoria at 10:16 pm. Some people wonder why the Second Avenue El was torn down before the Third Avenue El because it was more strongly built. The City knew the Second Avenue subway was years in the future. Knowledgeable people have accused the City of intentionally shutting the Second Avenue El first because the City knew the inferior Third Avenue El would have to come down sooner or later because of its condition--a backward way of forcing complete elevated removal on the East Side. The unified operation was titled "The New York City Transit System". The BMT lines became the BMT Division, the IRT lines became the IRT Division and the Independent became the IND Division. The initials were retained because a better name for the divisions could not be thought of at the time. In the late '70s and early '80s, mostly from the effects of the Chrystie Street connection project, the New York City Transit Authority tried to delete the separate identities of each division, dropping them from maps and no longer using these terms in station announcements. While you won't find references to these divisions on maps anymore, you will still hear references to them in some station announcements as well as by conductors-- and at some stations (the "IRT" station at Cortlandt St./World Trade Center has the IRT name on entryway signs). In addition, at the front and rear of virtually every underground station in New York City, you will find a red sign identifying to emergency personnel the current location, where the next emergency exits are, and what division (IRT, BMT, IND) of the subway you're currently in. In the years 1938 (before Unification) and 1940 (after Unification), the Board of Transportation put forth revised plans for additional lines. These were the first plans to affect all three divisions of the New York City Transit System. For the Bronx, three ideas were proposed - connecting the remnant of the 9th Ave El at 155th St with the IRT Lenox Ave Line, rehabilitating the abandoned New York, Westchester and Boston ROW and connecting it to the IRT Pelham Line, and extending the IND Concourse Line eastward towards Gun Hill Road. Speculation has it that the connection between the 9th Ave El and the Lenox Ave line never occurred because the third rail in the tunnel between Sedgwick and Jerome/Andersen Avenues would need to be modified to accommodate newer subway cars, and the cost may have been too great. The 9th Ave El remnant between 155th Street, Manhattan and 167th Street, the Bronx, became known as the Polo Grounds Shuttle and closed at 12:00am on September 1st, 1958. The NYW&B proposal, after being modified somewhat and at the cost of the Concourse Line extension, actually saw the light of day. For Manhattan, the Second Avenue Subway was still on the drawing board, having a northern terminal at Harding Ave in the Bronx, and connecting into the IND Court Street shuttle in Brooklyn. The 6th Ave line would get express service between West 4th St and 34th Street and an extension to 145th Street via Central Park and Morningside Drive. The BMT subway at 57th St / 7th Ave would tunnel under Central Park to 72nd St, then turn east into Queens via the Horace Harding Expressway (this is part of today's Long Island Expressway) and terminate at Marathon Parkway. Finally, the local tracks of the 8th Avenue subway would be extended crosstown via Worth St to the Bowery and then to Driggs Avenue in Brooklyn. The South 4th Street junction, partially built, could live again. In Queens, a connection at 11th St would join the BMT's 60th Street tunnel to the IND Queens Line's local tracks at Queens Plaza. The IRT Flushing Line would be extended underground, through an embankment and open cut to Bell Blvd and via an El to College Point. The LIRR Rockaway Line would be purchased and connected to the IND Queens Blvd Line and run to the Rockaways. The IND Queens Blvd line would be extended eastward, first to 184th Street, then to 212th Street as a 4-track subway, finally to Hillside Avenue and Little Neck Parkway as a 2-track subway. The "Van Wyck Stub" would finally be completed, and extended to Rockaway Blvd as a 2-track subway. The BMT's Fulton Street Line would be extended to 106th Street as a 4-track subway and link up with the IND Rockaway Line. (The implication is that the Liberty Ave El would be demolished, though this is not certain). There would be a further Fulton Street Line extension to 229th Street in Queens. The acquisition of the LIRR Rockaway Beach branch actually occurred, though not exactly as documented by this plan. In Brooklyn, a new IND division line would run from Houston St (via Essex St) to Utica Ave, then Flatbush Avenue, and terminate at Avenue U. The IRT Nostrand Avenue line would be extended to Voorhies Avenue in Sheepshead Bay, as subway to Ave T and elevated from there to Voorhies Avenue. The IND Smith St Line would be linked to the BMT's Culver Line at Cortelyou Road. A branch of the BMT Culver Line would extend from around 37th St, 10th Avenue and Fort Hamilton Parkway to the BMT's West End El at 86th Street. A connection would be built between the BMT's West End Line and the IND's South Brooklyn Line near Fort Hamilton Parkway. Finally, the original BMT Brighton Line along Franklin Ave would be extended to Lafayette Avenue to form a connection with the IND's Crosstown Line. Of these 6 proposals, only the IND/BMT linkup at Cortelyou Road would see the light of day, but not for another 14 years after Unification. One must wonder what the area of Avenue U and Flatbush Avenue, now the site of the Kings Plaza shopping mall, would have been like with an IRT line serving it. Finally, Staten Island was not forgotten, although this portion of the plan wasn't really new. Dating back to the 1913 Dual Contracts, this plan would run a subway under the Narrows to the Staten Island Rapid Transit. The Brooklyn portion would connect to the BMT's 4th Avenue line at 68th Street and run to New Brighton and Tompkinsville on Staten Island. While this never happened, evidence suggests that some provisions were made by the BMT for such a connection: the bridge over the LIRR Bay Ridge Branch is 4 tracks wide though only the northernmost two tracks are in use, and the 86th St / 4th Ave station appears to have "escapes" in the wall bricked over along the Manhattan-bound track. Amid all the proposals, funding was appropriated for extension of the Bronx Concourse Line beyond its current 205th Street terminal. However, Bronx residents favored rehabilitation of the New York, Westchester and Boston line from the city limits at Dyre Ave, abandoned since December 31st, 1937. As a result, these funds were diverted to rehabilitation of the NYW&B, connecting it to the White Plains Road line as a shuttle service. Using signals from the abandoned Fulton Street El, the Dyre Ave shuttle began service on May 15th, 1941. While it used IRT equipment, it was run as an IND Division line and staffed by IND crewmen. Shiny new station at Euclid Avenue on the IND Fulton Street Line, just prior to service beginning on the extended line, November 23, 1948. Collection of: Frank Pfuhler. World War II put a stop to any expansion plans that were put forth by the Board of Transportation in 1940. The 1940 plan was the last subway expansion plan on a grand scale until 1968. The post-war period saw some more subway expansion, but most of it was done on IND Division lines. The Fulton Street Line was extended to Broadway-East New York on December 30th, 1946, followed by an extension to Euclid Avenue on November 29th, 1948. Eventually, it would connect with the Fulton Street El east of City Line, forcing the razing of the Fulton El west of that junction. The IND Fulton Street Line extension to 229th Street was no more. On December 11th, 1950, the IND Queens Line was extended to 179th St and Hillside Avenue in Jamaica. The IND South Brooklyn Line (also known to some as the IND Smith Street Line, also the Crosstown Line) was linked up to the BMT Culver Line at Cortelyou Road on October 30th, 1954. The R1/9s, until this time, spent most of their lives underground. It wasn't until this connection was made that these cars were retrofitted with windshield wipers! On December 1st, 1955, the 60th Street tunnel connecting the BMT with the IND Queens Boulevard Line line opened. Track gangs connecting the IND subway to the Culver El at Ditmas Avenue, October 31, 1954. Trains would roll through the connection later that afternoon. Brian J. Cudahy. Plans for the Second Avenue Subway were revised yet again. This time, the line would run to 138th St in the Bronx, and a branch would be connected to the IRT Pelham Line. The Pelham Line would be widened to IND clearances north of 138th St. The line would terminate at 149th St / 3rd Avenue in the Bronx, where an easy transfer to the 3rd Ave El could be made. The idea for the Chrystie Street Connection took place in the late 1940s, and route proposals included a line that would run from 149th St /3rd Ave, via the Second Avenue Subway, Chrystie Street (a new tunnel), the Manhattan Bridge and Sea Beach Line to Coney Island. On November 5th, 1951, a $500 million bond issue was passed and set aside for building the Second Avenue subway. Instead, the Board of Transportation diverted the money to the repair of existing lines. The newly formed New York City Transit Authority spent some of the money on improving subway car design and getting air conditioning to work in subway cars. IND trains of 11 cars ran on the E and F lines between 1953 and 1957. In 1959, the Aqueduct Specials began service from the lower level of 42nd St / 8th Ave to Aqueduct Race Track, stopping only at Hoyt-Schermerhorn Streets. In 1975, the Special stopped using the lower level of 42nd St / 8th Ave. The Special would run until March 16th, 1981. The Board of Transportation ceased to exist on June 25th, 1953, replaced by the New York City Transit Authority (the TA). Probably one of the longest subway mileage expansions since the inception of the IND Division, expansion to the Rockaways, occurred because the TA was given a deal that it basically couldn't pass up. Yet rapid transit service had already run on this line going as far back as July 1898 during the early days of LIRR ownership, when the Rockaway Line was known as the New York and Rockaway Beach, or more simply, the LIRR Rockaway Beach branch. In 1898, the Brooklyn Union Elevated Railway built a connection from its Broadway line (known today as the Broadway (Brooklyn) / Jamaica El) west of the Crescent Street station to the LIRR's Rockaway Beach branch. The connection consisted of a ramp from the El down to the LIRR tracks on the surface of Atlantic Ave, and service ran only during the summer months. The connection allowed both the LIRR and the Brooklyn Union to operate trains to new terminals with a minimal investment. It also enabled the LIRR to make some additional money to offset both the costs of maintaining the trestles over Jamaica Bay (prone to fires) and the competition for passengers from a new and very popular destination, Coney Island. On July 17th, 1898, Brooklyn Union Elevated steam trains began running between Broadway Ferry, Brooklyn and Rockaway Park, Queens. In May of 1899, the Brooklyn Union Elevated Railroad was absorbed into the Brooklyn Rapid Transit Company (BRT); in 1901, the BRT electrified the Broadway Line. Steam service continued until 1906, because the LIRR didn't finish electrifying the Rockaway Beach branch until July 26th, 1905, and the Chestnut Street connection wasn't electrified until the following year. In fact, the Rockaway Beach branch was the first LIRR line to become electrified. Patronage was not as high as both railroads would have liked, so to improve ridership, the BRT extended its line across the Williamsburgh Bridge to Delancey Street. It also strengthened the Broadway El between the bridge and Chestnut Street, allowing the use of steel cars. The LIRR began running trains on the BRT Broadway El between Delancey Street and Rockaway Park on May 30th, 1908. Manhattan service was extended to Chambers Street on August 4th, 1913. The opening of Pennsylvania Station and World War I caused patronage to slide, and this shared service ended on September 3rd, 1917. After World War I, plans were put forth to convert the line to rapid transit as well as eliminate grade crossings on the Rockaway Beach branch and other LIRR lines. The concrete viaduct in the Rockaways was built to rapid transit specifications and completed in 1942. (Notice how the stations are roughly every 10 blocks apart, fairly common for a rapid transit type of service). These plans never reached fruition through the 1930s and 1940s. In the late 40s, the wooden trestles over Jamaica Bay seemed more prone to fires that "usual"; finally, on May 8th, 1950, a major fire destroyed significant portions of the structure. The LIRR was not in solid financial shape at that time, and decided not to rebuild the line. The LIRR had been trying to sell the Rockaway Beach branch within the City limits to the New York City Transit System (and later the Authority) for many years. On September 5th, 1952, the TA purchased the Rockaway Beach branch and the line in the Rockaways within the City limits from the LIRR for $8.5 million, considered a "steal" at the time. On June 12th, 1952, replacement of the wooden trestles over Jamaica Bay began. The TA gave a target date of July 1st, 1956, for the opening day. The IND Fulton Street Line would connect to the Fulton St. El east of City Line, and at Rockaway Blvd, a 2-track connection to the new IND Rockaway Line would be made. The original plan for the connection with the Queens Line at 63rd Drive would not come to pass. LIRR service to Rockaway Park via Far Rockaway ended on October 2nd, 1955. Between October 3rd, 1955 and June 8th, 1956, the elevated trackage in the Rockaways was converted for operation by the IND. The terminal station at Mott Avenue was severed from the LIRR. Former LIRR stations at "The Raunt", Goose Creek and Hamilton Beach were eradicated when the IND took over. "Rockaway Here We Come!" First subway train to the Rockaways, near Howard Beach. Photo by: Frank Pfuhler, June 28, 1956. Despite a strike at Westinghouse that threatened late delivery of electrical equipment, the TA met its milestone. (The electrical equipment was borrowed from the Dyre Ave line). On June 9th, 1956, the first IND clearance train left the Fulton Street El bound for the Rockaways. On June 28th, 1956, the first official train left Howard Beach at 5:30pm, dressed with a "Rockaway, Here We Come" sign. It was not of the standard R-10 types; for this occasion, the first train would consist of newer equipment, the R-16s, even though they didn't provide normal service on the line. The R-10s couldn't operate on the line initially because of the power equipment problems as a result of the Westinghouse strike; standard IND R-1/9s provided the service for the first few months. These additional R-1/9s cars needed to be fitted with windshield wipers, in addition to those cars already providing D service over the Culver Line in Brooklyn. Initial R-1/9 service had speed restrictions due to the power "shortage". For a time, the Rockaway Line was considered a separate division of the NYC Transit System, called the Rockaway Division. Until the mid-70s, an extra fare of 15 cents was collected at Broad Channel. While the E train provided service on the line, it was the longest rapid transit run in New York City (over 36 miles); in the late 50s, some said this was the world's longest rapid transit run. The extra fare was required until September 1st, 1975, when the fare became 50 cents anywhere on the transit system. Mott Avenue was not yet open when IND Rockaway service began; the temporary terminal was Beach 25th St / Wavecrest. Mott Avenue opened in June of 1958. The remaining portion of the LIRR Rockaway Beach branch north of the Fulton Street El was abandoned by the LIRR on June 8th, 1962. While talk of resurrecting this line for JFK airport service surfaces from time to time, the ROW north of the Liberty Avenue El continues to remain unused to this day. One of the last subway expansion plans put forth by the Board of Transportation was a connection between the BMT and IND in lower Manhattan. Connections to the IND Houston Street line and the BMT lines crossing the Manhattan and Williamsburgh Bridges would provide BMT trains direct access to 6th Avenue. In conjunction with a rebuild of the DeKalb Avenue station in Brooklyn, eliminating junctions at-grade, and connecting the Culver Line with the IND South Brooklyn Line, capacity of the BMT Southern Division through DeKalb Avenue would increase substantially (by 18 trains per hour by some estimates). As part of the DeKalb Avenue work, the Myrtle Avenue station would close on July 11th, 1956. The DeKalb Avenue junction modifications were completed in 1962. Also part of this project was the lengthening of BMT platforms to 10 car lengths for lines that would be affected by the Chrystie Street connection. This included the BMT Brighton Line. In November of 1951, a bond issue passed that enabled this work, as well as the completion of the IND 6th Avenue express tracks between West 4th and 34th Street, to begin. This project became known as the Chrystie Street connection. Before this connection opened, between the hours of 7:50am and 8:50am, 65 trains consisting of 520 cars with a capacity of 130,000 passengers passed through DeKalb Ave; after its opening, the capacity increased to 80 trains of 670 cars with 167,500 passengers. Meanwhile, plans for the 2nd Avenue subway ground to a halt yet again. But this didn't stop the TA from cutting back service on the 3rd Ave El. The Board of Transportation, in 1951, cut back 3rd Ave El service below 149th St to weekday service only. The TA closed the 3rd Ave El below 149th St permanently on May 12th, 1955. Promises were made to resurrect the 2nd Ave subway project in exchange for demolition of the El. Nothing happened for nearly 15 years, and what was started was eventually stopped due to fiscal problems. East Side subway service has never been the same since. A Fan Trip using the Budd R-11 cars stops at Grand Street on the Chrystie Street connection. The date was November 18, 1967. Service would begin one week later on the 26th. Collection of: David Pirmann. First scheduled for March 1967, then May, the Chrystie Street connection opened on November 26th, 1967, affecting nearly every BMT and IND line in the city. But it was almost delayed at the last minute yet again. Mayor John Lindsay wanted the route changes through Chrystie Street delayed because he received complaints about them and wanted to discuss them with TA officials first. The number of trains that were proposed to run through DeKalb Avenue was questioned. He also inquired as to why these changes were being made by the TA, knowing that the TA was to become part of the larger Metropolitan Transportation Authority in March 1968. By this point, the plans were too far advanced to delay them any further; the TA agreed to "study" the service changes and make adjustments as needed. The first train affected by the vast subway service changes was a RR local leaving 95th Street at 12:08am, initiating a new weekend service. (This train used to terminate at 57th St/7th Ave on Sundays). The first train through Grand Street was a D / Brighton Express that left Coney Island at 12:10am, headed for 205th Street. (The D route used to travel the Culver Line). The NX super-express began the next day; 5 trains were scheduled in each direction during rush hours. Later increased to 7 trains in the morning rush, the NX was supposed to provide service for an influx of new residents at public housing projects in Coney Island. The first few weekdays of the revised services caused massive confusion for both riders and train crews. Compounding these problems were two power outages on November 28th affecting the IRT Flushing Line and BMT Astoria Lines, requiring reroutes of trains that were just permanently "re-routed". The IRT outage was traced to a failure at the Queens Plaza substation. The power outages began at 6:45pm; full power was back on-line at 7:48pm. At 6:48am on November 28th, a D / Brighton Express train was misidentified at DeKalb Avenue and sent up the south side of the Manhattan Bridge to Canal Street. 800 passengers were discharged at Canal Street. The train then ran light to Queens Plaza via the 60th Street tunnel and Broadway Express, where the motorman changed ends and took the train via the 53rd Street tunnel and 8th Avenue local to a lay-up track at 30th St. The motorman changed ends one more time, and ran light to 59th St / Columbus Circle, where he continued along the D route to 205th Street. Originally due at 7:39am, he terminated at 205th St at 8:57am. It was later found out that the motorman punched the wrong button at DeKalb Avenue, and was sent back to school for some additional training. (He was not fired). The BMT and IND would be entities much less independent of one another. In addition, the BMT's system of one-way rush hour traffic was forever changed, with lines combined or lengthened. No more would BMT trains be filled to capacity in one direction and virtually empty in the reverse direction during rush hours. F, Queens Express / 6th Ave Local, from Coney Island via Culver & the IND South Brooklyn Line to 6th Ave, local to 53rd Street/Lexington Ave, Queens Express to 179th St, Jamaica. NX, rush hour super express, Brighton Beach to 57th St / 7th Ave via Stillwell Ave, Sea Beach Express tracks, 4th Ave Express, Manhattan Bridge and Broadway Express. The NX lasted only until April 12th, 1968. NX line train on the BMT Sea Beach Line at 8th Avenue, April 11, 1968. NX service would cease the next day. Photo by: Steve Zabel, Collection of: Joe Testagrose. The NX stopped running on 4/12/1968. The RJ stopped running on 6/28/1968. The JJ and TT stopped running on 6/30/1968. The MJ (Myrtle Ave El) closed on 10/4/1969. The QJ ended on 12/30/1972. The EE ended on 8/27/1976. The KK ran until 12/29/1972. The K (the initial line, not the replacement for the AA in the 1980s) lasted until 8/27/1976. The Independent always thought big. It seemed that every decade or two, there was another grand plan for system expansion. And there was always some significant regional or world event to quash it down. The 1929 plan was stopped by the Depression. The 1938/1940 plans were stopped by the advent of World War II. Some of the 1949 plans were adapted, but funds were diverted to keep existing lines running. Nonetheless, there were still big plans for expansion, but by 1968, with a unified system for 28 years, the expansion plans were for the entire region, not just the IND division. The Metropolitan Commuter Transportation Authority (what the MTA was called when it was first formed in 1968) released its "Program for Action" on February 28th, 1968. The program had two phases: phase I considered projects for immediate action and would run over a ten year period and phase II was to be carried out at the completion of phase I. The plan considered all aspects of regional travel, affecting the subway, the LIRR, Penn Central, Erie-Lackawanna and New Haven railroads, as well as the regional airports. Aggressive completion of the 63rd Street tunnel (at the time this project was already planned) as well as the connections to the IND 6th Ave. Line and the BMT Broadway Line. A super-express bypass for the IND Queens Blvd line, running along the LIRR main line that would leave the Queens Blvd. line at 41st Ave. and return to the Queens Blvd. line in Forest Hills. This one-track line would provide additional express service in the peak direction. A new subway line would divert from the IND Queens Blvd. line in Elmhurst, Queens and run along the Long Island Expressway to Fresh Meadows, serving northeastern Queens. This would be a two-track line. A new subway line would divert from the IND Queens Blvd. Line at the Van Wyck stub at Hillside Ave. and run along the LIRR Atlantic Branch ROW to Springfield Blvd, serving southeast Queens. This line would also be two tracks. (This line was actually built as far as Parsons Blvd. and Archer Ave., the terminal of today's E, J and Z trains, and opened in 1988). The Second Avenue Subway from 34th St to the Bronx, with a connection to the 63rd St tunnel. The portion of the line from 63rd St, Manhattan to 138th St, the Bronx, would be built as two tracks, with provisions to expand it to four tracks "easily". The line would continue from 138th St along the ROW of the former New York, Westchester, and Boston Railway to Dyre Ave. The stations along the Dyre Ave. line would be restored to their original widths (they were "expanded" somewhat to accommodate IRT trains). The junction at East 180th Street, as well as the approach of the IRT White Plains Road Line to East 180th St would be reconstructed to allow cross-platform transfers between White Plains Road and Second Avenue Trains. There would be a connection with the IRT Pelham line at Whitlock Ave. and stations would be shaved back for the larger IND/BMT subway cars. The IRT Pelham Line would terminate at Hunts Point Avenue. The IRT Division would see its Nostrand Avenue line extended along Flatbush Avenue in Brooklyn to Avenue U. (In 1968, Kings Plaza (Brooklyn's first "suburban type" shopping mall at approximately the same location) did not yet exist). The IRT New Lots Ave. line would be extended southerly to Flatlands Ave. and Linwood Street. The line would run at ground level. In conjunction with this and the IRT Nostrand Ave. line extension, the Rogers Ave. junction would be reconstructed to increase capacity. Completion of the Second Avenue Subway from 34th Street south to the Financial District along Water Street to Whitehall Street. A midtown distribution system along 57th, 48th, 42nd and 33rd Sts., using some kind of guided systems technology (ala Morgantown) to link terminals, offices and other travel points. Extension of the subway east of Jamaica and razing the El along Jamaica Avenue. Extending the Pelham Bay Line to Co-op City in the Bronx. Extending the IND Concourse Line to White Plains Road, providing easy transfers to the IRT White Plains Road line. Some revisions to the plan that were approved by the Board of Estimate in May 1968 were a new IRT Utica Ave Line to Kings Highway extended from the IRT New Lots Ave Line, extension of the IRT Nostrand Ave Line along Nostrand Ave to Ave W in Sheepshead Bay (instead of Flatbush Ave to Ave U) and the relocation of the Canarsie Line (open portion) to the Bay Ridge Line cut. Unlike the 1929 and 1938/1940 plans (which for the most part remained plans), the 1968 plan actually saw construction. 43 years after it was originally proposed, construction on the Second Avenue Subway began on October 27th, 1972, when both the mayor and governor broke ground for the new line at East 103rd St. and Second Avenue. A second section between 110th and 120th Streets was also started. The stations originally planned for in Manhattan were 125th Street, 34th Street, Houston St. and Wall Street. Opposition to such few stops forced compromises and additional stops were planned for 106th St., 96th St., 86th St., 72nd St., 57th St. and 48th St. The number of stops added negated the possibility of expanding the line to four tracks in the future. South of 34th St., the plan for a straight run down Second Ave., Chrystie St., the Bowery, Pearl and Water Streets, drew opposition from residents east of Second Ave. who felt that the line would not serve them well. In January of 1970, the Board of Estimate revealed a new plan for the area - a loop line that would run as follows: southbound IND trains would leave the IND Houston Street line and run east to Avenue C, north to 14th Street and west along the current tracks of the BMT Canarsie Line terminating at 14th St / 8th Avenue. Concurrent with the building of the Confucius Apartment complex in Chinatown, a third 700-foot section of the Second Avenue line was built. The southern portions of the trackways begin separating for cross-platform transfers at Grand Street. Legend has it that the walls of the Grand Street station are built to be "easily" knocked down and there are trackways for the Second Avenue Line behind these walls. Construction on the 63rd Street Line began on November 25th, 1969. Tunneling proceeded in a westerly direction from Queens and in both directions under Welfare (now Roosevelt) Island. Trenches in the riverbed were dug to receive four prefabricated concrete tubes that were sunk into place and connected. Dimensions of the tubes in the west channel of the East River were 375 feet long; the east channel had tube sizes of 380 feet long. All the tubes were 38 feet in diameter. The 63rd Street tunnel was designed to accommodate subway trains on the top level and LIRR trains from Sunnyside Yard on the lower level. LIRR trains would then turn south around 3rd Ave. and run to a proposed Metropolitan Transportation Center (MTC) in the vicinity of 48th St. and 3rd Ave. The MTC would facilitate easy intermodal transfers between the LIRR, the Second Avenue line, the IRT Lexington Ave. Line at Grand Central as well as Grand Central Terminal. On October 10th, 1972, the two tunneled sections of the 63rd St tunnel were joined as one. When it came time to build an unplanned shaft for construction vehicles to enter and exit the 63rd St tunnel, East Side residents and businesses opposed it vehemently, and battles over its location actually delayed the project somewhat. New R-44 cars at Smith/9th Street in December 1971. Photo by: Doug Grotjahn. Collection of: Joe Testagrose. New subway cars, the R-44s, were designed and built in anticipation of running 70mph trains under 2nd Avenue. The MTA actually announced a plan for 80mph trains, but it was reduced to 70mph because the TA didn't want to consider a new, lightweight truck to enable these speeds. (It should have listened to itself when the R-46 car order was placed). A speed record of 83mph was obtained during tests on the LIRR. Legend has it that half the motors burned out after that record-shattering run. On October 5th, 1971, the first R-44 test train ran to 57th St for public display. It was tested on the A, D, E and F lines. When the R-44s initially entered service, failure rates increased tremendously because of a combination of new technology and inadequate training. Foreshadowing what was to occur in 1975, the plans were shelved. The bond issues that would have paid for them were defeated at the ballot box. Finally, in 1975, due to the City's fiscal crisis and the need to maintain the existing infrastructure, the Second Avenue subway construction stopped. The sections actually finished (completed tunnel, no track) are from the Bowery to Chrystie Street, East 2nd to East 9th Streets (filled back in), East 99th to East 105th Streets, and East 110th to East 120th Streets. 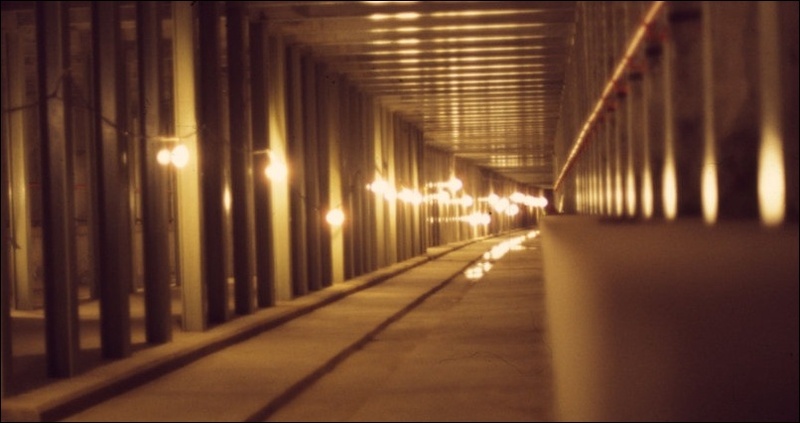 The 63rd Street Tunnel (long called "the tunnel to nowhere") managed to soldier on into the late 1980s, often criticized for taking so long to complete, and investigated for suspicion of bribery and corruption. $63 million had been spent on 2nd Avenue Subway construction through December of 1978. As a side note, the New York City Transit System played host to the Urban Mass Transit Administration's State-of-the-Art Car (or SOAC). The SOACs looked very much like R-44s and in fact were based on the R-44 car body. Regular service on the SOAC cars began May 17th, 1974 during the mid-day hours, and the cars ran on the A, D, E and N lines through July. The SOACs then went on to visit Philadelphia, Chicago and Boston. The last 25 years were relatively quiet for the IND Division and the entire New York City Transit System in terms of expansion, but they were very noisy and dirty in more ways that one. Years of deferred maintenance and fiscal posturing took their toll on rolling stock and the infrastructure. In the late 1970s, hundreds of slow speed orders were found throughout the system due to the risk of derailments. Graffiti covered nearly every car in the system. The number of available cars for rush hour services continued to drop, from 5,557 in 1976, to 5,025 in 1977, to 4,900 in May of 1978. Failure rates were at all time lows -- the Mean Time Between Failures system-wide was 6,000 miles in 1980. In 1977, the R-46s developed cracks in the Rockwell trucks that carried them; the TA eventually decided that ALL the R-46s would get replacement trucks. By 1979, the cars were limited to use between 6am and 10pm. By 1980, cracks were being discovered in the trucks at a rate of 15 per month during bi-monthly inspections; the R-46s were limited to rush hours only in an effort to cut down on the number of cracks that were occurring. R-46s were assigned to the Brighton Line, but were withdrawn after Brighton Beach residents complained about excessive vibrations being caused by the trains. The situation became so bad that 100 R-16s, at a cost of $200,000, were taken out of mothballs and returned to the subway for a few more years. The R-16s themselves were retired because of high maintenance requirements -- the controller would frequently short out. Ironically, the R-16s were retired as the R-46s were put into service! The City ended up suing Rockwell and Pullman Standard (the manufacturer of the R-46s) for $112.3 million in damages for this problem, and another $80 million in damages for other R-46 defects such as defective handbrake assemblies, cracked electrical cables and substandard waterproofing in the car's flooring. Eventually, Pullman Standard went out of the subway car manufacturing business. Headways on the A, D, N and RR lines were 5 minutes during rush hours in 1978; they were 4 minutes in 1974. In December of 1978, the worst subway station, in terms of crime and its condition, was Grand Central on the Lexington Ave line. The worst elevated station was Metropolitan Avenue in Queens. The subway cars in the worst shape were the R-10s and the track in the worst shape was that of the BMT's Sea Beach line, which according to some reports, hadn't seen major reconstruction since 1915! Service was poor and crime was up. Newspaper headlines day after day screamed about new crime. It became so bad that Transit Police Chief Sanford Garelick was fired on September 10th, 1979. In an attempt to alleviate the crime situation, and extend the life of the fleet, shorter trains ran during the mid-day and nighttime hours. The infrastructure was in such poor condition that even the 63rd St and Archer Ave subway projects were threatened by 1980. Somehow, the 63rd St tunnel and the Archer Avenue subway projects continued. The first tunnel between the Jamaica Ave El and the Archer Ave subway was holed through on October 11th, 1977. The second tunnel connection was joined on December 14th, 1977, when at 2pm, the MTA held a "holing through" ceremony. Tunnel work on this portion of the line started on March 17th, 1977. As late as December 1978, the 63rd Street line was intended to link up with the Sunnyside Rail yards and the LIRR ROW to Forest Hills. 80 mph trains were predicted to run through it by 1990. The Archer Avenue subway was supposed to run to Springfield Blvd. Due to funding problems, the 63rd Street line was cut back to 21st Street in Queensbridge, giving it the moniker of "the tunnel to nowhere". The extension to Springfield Blvd has been shelved. In October of 1985, the 63rd Street tunnel was threatened yet again, due to cost overruns, criminal and negligence investigations, and the realization that the massive project would serve only 2,500 daily riders. After engineers inspected the tunnel, the MTA decided to continue with the project, and then further decided to connect the 63rd St line with the IND Queens Blvd Line. Other than these projects, no other construction took place. In fact, lines were cut back or closed outright. The E train stopped using the lower level of the 42nd St / 8th Ave station on February 28th, 1975. The Culver Shuttle between Ditmas Ave and 9th Ave, Brooklyn, having been reduced to a single track for many years and in deteriorating condition, closed permanently on May 11th, 1975. On August 27th, 1976, GG service was cut back from Church Ave to Smith / 9th Streets, Brooklyn. The K and EE routes were eliminated. On December 15th, 1976, GG service on the other end of the line was cut back to Queens Plaza. 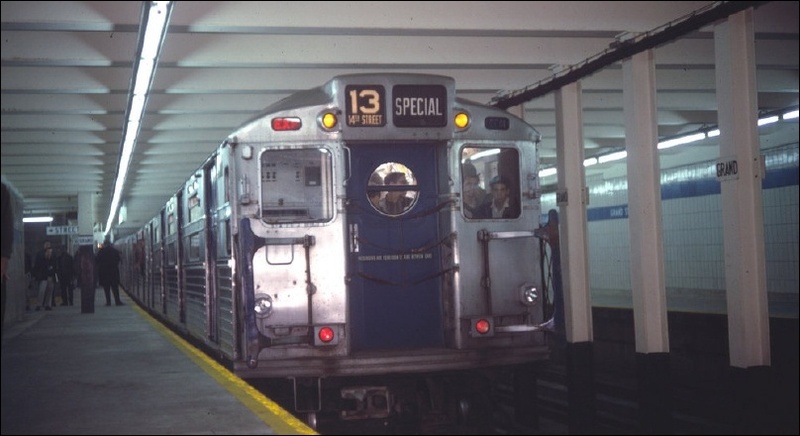 The R-1/9s made their last revenue trip on the J line (Jamaica Ave El) on March 31st, 1977. The Jamaica Ave El itself was cut back from 168th St to Queens Blvd on September 11th, 1977, and then 121st Street in the early 1980s. JFK airport express at 57th Street on the 6th Avenue Line, November 1979. Photo by: Doug Grotjahn. Collection of: Joe Testagrose. With all the service cuts, though, a new service to JFK Airport, "The Train to the Plane", was started on September 23rd, 1978. The JFK Express, a virtually non-stop ride between 57th St / 6th Avenue in Manhattan, and JFK Airport, cost $3.50 one-way. Patronage never grew to the TA's expectations and the service was discontinued on April 15th, 1990. Not all was doom and gloom during the 1970s; in fact, for railfans, July 2nd, 1976 is a landmark day. The New York City Transit Exhibit opened up in the unused IND Court St shuttle station as a temporary exhibit for the Bi-centennial. Shortly afterward, the first Nostalgia Specials of BMT D-Types, AB Standards and IND R-1/9s were running on weekends between June and November. During the summers of 1979 and 1980s, three Nostalgia Specials ran at the same time, offering destinations of the Cloisters, Coney Island or Rockaway Park, all of which started at the Exhibit, and all for the whopping price of $3.00 ($5.00 to the Cloisters). In 1979, a Diamond Jubilee special of Lo-V cars ran in revenue service on the Lexington Ave line, running local from 59th Street to South Ferry. By 1982, though, the Nostalgia Specials had stopped running. The museum collection was allowed to deteriorate. However, due to the Exhibit's success, it became the permanent home of the New York Transit Museum. The D-Types were rehabilitated and began running as Nostalgia Trains again on June 23rd, 1995. The IRT Lo-Vs ran in revenue service again, on the Grand Central Shuttle, on October 27th, 1994. In July of 1996, they ran along the IND Fulton Street and Rockaway Lines to Far Rockaway and Rockaway Park. Three Lo-V fantrips covered the IRT in Brooklyn, Manhattan and the Bronx in 1996, 1997 and 1998. The R1/9 cars in the collection are in various states of restoration and in 1998, work began on restoring the AB standards in the collection. The resurrected Nostalgia Trains, mostly using the D-Types, generally ran every three months. In 1999, the Nostalgia Specials stopped running again because of needed bodywork. Early in 2000, the Transit Museum itself is closing for six months of renovations. Eventually, the MTA turned a corner. It became serious about maintenance and implemented a series of Capital Plans to repair the current system. The TA implemented Scheduled Maintenance Service to replace components before they were expected to fail. Subway cars from the IRT R-26 to the IND/BMT R-46 went through general overhaul programs to bring the fleet to a state of good repair. Older equipment (R-32s and up on the IND/BMT Divisions, and R-26s and up on the IRT Division) was retrofitted with air conditioning. Little by little, the slow-speed areas were repaired and welded rail could be seen on many lines, offering a smoother and quieter ride. By the late 1990s, mean failure rates approached the best they've ever been in the history of the system. The south side of the Manhattan Bridge was closed for repairs in the mid-1980s; the years of running heavier steel subway cars on the outside edges of the bridge cause the structure to twist several feet as the trains cross the structure. In Engineering lingo, this motion is called "torsion". The construction was expected to last "a few years"; the south side of the bridge is not expected to open now until 2001. An entire generation of New Yorkers is growing up wondering "what those tracks on the side of the Manhattan Bridge closest to the Brooklyn Bridge are for". The 63rd Street tunnel eventually opened to 21st St./Queensbridge in 1988. Construction is currently underway to connect this line with the IND Queens Blvd. Line east of Queens Plaza and service is expected to start in 2001. Even though this line is relatively new, its roadbed needed to be reconstructed in 1998 and 1999 due to "inferior concrete" and premature tie wear along the roadbed. The Archer Avenue subway was completed as far as Parsons Blvd. and opened on December 11th, 1988. 63rd St. Tunnel Construction under Central Park, July 1976. Photo by: George Cuhaj. In 1993, the MTA introduced the Metrocard. On July 4th, 1998, passengers using the MetroCard were given free transfers between buses and the subway, eliminating two-fare zones. Unlimited weekly and monthly fare cards were also introduced. On January 1st, 1999, the FunPass (a daily unlimited pass) was introduced, though you couldn't buy it at token booths. MetroCard Vending Machines are being slowly introduced throughout the system, where all kinds of Metrocards, from single use to the FunPass, can be purchased. Crime has been steadily decreasing since 1995. At the dawn of the next millennium, ridership on the New York City subway is booming. And what of the 2nd Avenue Subway? As of this writing, Federal Transportation Administration (FTA) approval for the Second Avenue subway from 125th St. to 63rd St. has been granted and New York State needs to find a way to pay for its share of the project. The MTA feels it can build the first leg between 63rd Street and 125th Street with its current budget and fare (the current cost estimate is over $5 billion dollars), but politicians want the line extended to the southern tip of Manhattan as part of the first phase, increasing the cost of the project to over $15 billion. Stay tuned, because the 70-year saga of the Second Avenue Subway is far from over. William Barclay Parsons, the chief engineer of the IRT, got all New Yorkers used to the idea of express service. Passengers boarded locals, traveled to the next express stop, and caught an express to whisk them to their destinations. Engineers of the Independent line tried to force passengers to stay on the local; for example, between 125th St and 59th St, there are no express stops. Yet from 59th St to West 4th St. (on the 8th Avenue line), there are only 2 more local stops than express (50th St and 23rd St). As a result, most passengers traveling downtown from Harlem don't have a need to change trains. The Independent was built with gentler curves and flying junctions, permitting trains to travel faster. In two places, on the Queens Blvd line between Queens Plaza and Roosevelt Ave, and again on the South Brooklyn Line between 7th Ave and Church Ave., the express tracks diverge from the local tracks, taking a more direct approach to the next express stop. The R1/9s borrowed a good idea started with the BMT D-Type Triplexes - they were built with end roll signs to identify the train and its destination. And, besides having marker lights, they were also built with small lights on the front and rear of each car that identified if the train was an express or a local. The front roll signs continued through the R-38 subway car order, and the "express/local" lights continued into the R-40 order. The incandescent light bulbs used in the Independent were "left-hand" threaded. Vandals who didn't know this were surprised when they found that they would not screw into ordinary light fixtures. The station walls were built to accommodate advertisements; the ads placed in BMT and IRT stations were an afterthought. Some people thought the ads defaced the IRT/BMT stations; IND stations always seemed to have them. More recently, in many former IND stations, NYC Transit is painting over the spots where the ads used to be, and some people feel that THIS is defacing the station! The Independent was designed as a unit - not a line here or a line there. Sections that required it were built with many provisions for enhancement and expansion. The stations were planned to be of uniform size (660 feet to accommodate 11 car trains) so that full-length trains could be operated on all routes, and rarely would a platform be jammed. In reality, it didn't quite work out that way. Virtually all local stations on the 8th Avenue line between 72nd Street and 163rd Street -- Amsterdam Avenue have lengths of 600' (the exceptions being 96th Street which was 615' on both levels -- that length being the standard for all stations from the late 1940's onwards -- as well as the 81st Street-Museum of Natural History station, the uptown platform being 630' long, the downtown platform 615'). The same is true for most local stations on the Queens Boulevard branch between Elmhurst Avenue and 67th Avenue. On the other end of the platform length spectrum are some of the Sixth Avenue (Avenue of the Americas) stations. 34th Street, the uptown platform was originally an eye-popping 745' (745'!) long, the downtown platform was originally 685'. Both platforms of the 23rd Street station are 670', and 47th-50th Street -- Rockefeller Center is 665'. Station tile bands belong to five color families - Red, Yellow, Green, Blue and Purple. The color of the tile changes at each express station, with the local stations following it (going outbound) belonging to the same color family. With one exception, these groupings follow the same order: (going outbound): Purple, Blue, Green, Yellow, and Red. The exception is on the Fulton IND - Utica/Ralph/Rockaway (red family) is followed by blue family stations Broadway-ENY, Liberty, Van Siclen and Shepherd, THEN comes purple (Euclid) THEN green (Grant). Express stations (except on 8th Avenue) have wider tile bands than local stations. Tablets are simple, with a common design, and black tile with white letters spell out the station name on the wall. The Crosstown line, having no express stations, uses three forms of green in its tile bands, with light green indicating transfer stations. (Broadway was planned as a transfer to an IND Second System line). Compared to the BMT and IRT, the Independent was unique in that it was largely built to compete with existing lines, rather than extend service to new areas. The IND had its own police force. The NYPD Transit Bureau evolved from the IND police force, and at first, only had arresting powers on the IND. When Unification occurred in 1940, patrols later expanded to the BMT and IRT. (It wasn't until 1947 that the Transit Police had powers equal to other officers of the NYPD). The IND was publicly planned, owned and operated, insulating it from market considerations, for better and worse. The IND was almost entirely underground. A subway station located below 212th Street in Queens Village. Supposedly, there are skylights on the sidewalk along 212th St and Jamaica Avenue, and a subway tunnel along 73rd Ave. right to Alley Pond Park. Hillside Avenue widens out considerably at Springfield Boulevard in Queens Village, with service roads and main roads a la Queens Boulevard. It's said that this was a provision for a new eastern terminal for the IND, and the 1929 plan does have trains running to Springfield Boulevard. July 1, 1924: Board of Transportation took office. March 14th, 1925: Groundbreaking of 8th Avenue subway takes place at 123rd Street and St Nicholas Avenue. July 8th, 1931: First train of R-1s leaves Coney Island at 11:35am and runs via the Sea Beach line to Times Square. The trip took 42 minutes. November 27th, 1931: R-1 trains running on the Sea Beach line are withdrawn due to the expiration of an insurance policy. August 8th, 1932: Simulated schedules began on the IND. Express train schedules were run on Monday, Wednesday and Friday; local train schedules on Tuesday and Thursday. September 7th, 1932: Full simulated schedule implemented. September 10th, 1932: IND (the 8th Avenue subway) opens at 12:01am. September 22nd, 1932: First IND delay. September 26th, 1932: First fire (minor) on the IND. February 1st, 1933: IND expands to Jay Street, Brooklyn. (High Street is not yet open. Completion of escalators deferred the opening of High Street until June 24th, 1933). March 20th, 1933: Extended to Bergen Street. July 1st, 1933: IND service extended to 205th St and Bainbridge Ave, the Bronx, via the Grand Boulevard & Concourse. August 19th, 1933: IND service extended to Roosevelt Avenue, Queens. October 7th, 1933: Brooklyn service extended to Church Avenue. January 1st, 1936: The Houston Street line between West 4th St and East Broadway opens. February 17th, 1936: Stored train on unused express tracks of IND Smith St line rolls into another train, killing a conductor and injuring the motorman, and demolishing 2 cars. April 9th, 1936: Service extended from East Broadway to Jay Street. Also, the Fulton St (Brooklyn) line extended from Jay Street to Rockaway Avenue. Court Street shuttle in service. December 30th, 1936: Queens service extended to Union Turnpike. April 24th, 1937: Queens service extended to 169th Street, Jamaica. July 1st, 1937: Brooklyn-Queens crosstown line between Nassau Ave and Hoyt-Schermerhorn Streets opens for service. September 4th, 1937: IND claims to have carried its 1 billionth passenger. December 31st, 1937: Service on the New York, Westchester and Boston Railroad ends. March 30th, 1939: A "GG" train "keys-by" a signal and crashes into a stalled train, injuring 14. April 30th, 1939: The "World's Fair Railroad" opens. June 1st, 1940: The city takes over the BMT. The 5th Ave and Fulton St (both Brooklyn) Els are abandoned. On June 12th, the IRT was taken over. The 9th Ave El between 155th St and South Ferry, and the 2nd Ave El north of 59th Street, are abandoned. October 28th, 1940: Last train runs on the "World's Fair Railroad". December 15th, 1940: The 6th Avenue IND opens for service. Local service only. May 15th, 1941: Shuttle service between East 180th St and Dyre Avenue on the former NYW&B begins. Service is operated by the IND Division of the New York City Transit System. May 1941: Miss Subways contest begins. The first Miss Subways was Mona Freeman. June 10th, 1946: Court Street shuttle closes. December 30th, 1946: IND Fulton St line is extended to Broadway / East New York. July 10th, 1947: R-10 prototype 1575 (former wrecked R-7A) displayed at 34th St / 6th Avenue. November 14th, 1947: Braille map of NYC Transit System released, 70 pages. August 19th, 1948: First R-10 cars delivered. July 1st, 1948: Fare raised to 10 cents. 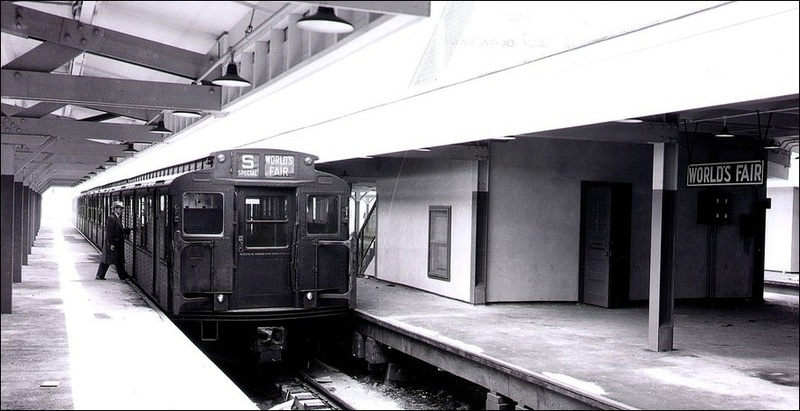 November 20th, 1948: First R-10 cars begin revenue service on the 8th Avenue Line. They'll run until 1988. November 29th, 1948: Fulton St service extended to Euclid Avenue. December 11th, 1950: IND Queens Service extended to 179th St, Jamaica. March 25th, 1953: New York City Transit Authority is born. June 25th, 1953: Board of Transportation control ends. One month later, the fare is raised to 15 cents. October 30th, 1954: IND trains run to Coney Island through the new connection between the IND Smith St line and the BMT Culver Line. December 1st, 1955: 60th St tunnel to Queens opens. April 29th, 1956: IND Fulton St subway connects with the Fulton St El at City Line, Brooklyn. The Fulton St El west of Hudson Ave is closed and subsequently demolished. June 14th, 1956: First subway strike. A 9-hour strike cripples service. June 28th, 1956: IND Service extended to the Rockaways using the former LIRR Rockaway line. May 6th, 1957: Dyre Ave thru service begins. The Dyre Ave line is now considered an IRT line. July 5th, 1958: Rockaway Express / Playland special service leaves (the lower level? of) 42nd St / 8th Ave using R-16 cars. Music played over the PA system. Service ends on September 14th, 1958. September 14th, 1959: Aqueduct Special service begins. The train makes one stop at Hoyt-Schermerhorn Streets, Brooklyn. November 28th, 1962: IND work train at Van Sicklen Ave (Culver Line) falls to the street, killing one crewman. November 9th, 1965: The Great Blackout starts at 5pm. Service restored to normal by 9:45am the next day. January 1st, 1966: 13-day transit strike cripples city. July 5th, 1966: Fare raised to 20 cents. July 19th, 1967: The first successful train of air-conditioned cars, a 10-car set of R-38s, went into service on the IND Division. November 26th, 1967: Chrystie Street connection opens. March 1st, 1968: The Metropolitan Transportation Authority is born. March 23rd, 1968: The slant R-40s begin service on the F line. 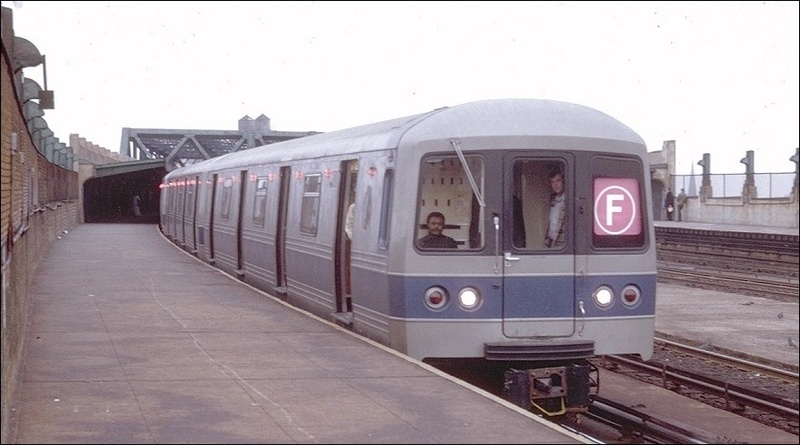 March 10th, 1969: Modified R-40s begin service on the F line. October 3rd, 1969: The Myrtle Ave El south of Broadway (Brooklyn) is abandoned. January 4th, 1970: Fare raised to 30 cents. May 20th, 1970: A train of out-of-service R-40 cars, led by 4501, crashes into a GG train of R-16 cars, killing 2 and injuring 70. January 31st, 1972: A set of R-44s in acceptance and performance testing set a subway speed record of 83mph on the LIRR. August 15th, 1972: Ground broken for the Archer Ave (Queens) subway. October 10th, 1972: 63rd St tunnel sections joined under the East River. October 27th, 1972: Ground broken for the Second Ave subway at 2nd Ave and East 103rd St.
February 28th, 1973: The first R-44s were placed in service. April 28th, 1973: 3rd Ave El closes in the Bronx. January 5th, 1972: Fare raised to 35 cents. March 27th, 1975: The TA takes delivery of the first R-46s. They will force the remaining 848 R-6 to R-9 cars that ran on the original Independent into retirement. September 1st, 1975: Fare raised to 50 cents. 1976: Miss Subways contest ends. The last Miss Subways was Heidi Hafner. July 2nd, 1976: The New York transit Exhibit, a "temporary" exhibition, opens at the former IND Court Street shuttle station in downtown Brooklyn. February 1st, 1977: New subway map displayed at Cityana Gallery. It would eventually replace the London Underground-like map issued in 1972. July 3rd, 1977: An A train derails at 135th Street; 14 hurt. March 28th, 1977: First crack discovered in the R-46 Rockwell trucks. An F train motorman heard a loud noise under the car, and an inspection revealed a truck failure. The R-46s were in service only 15 months, and when purchased, their expected service life would be until 2009. December 29th, 1977: An F train slams into an E train at 53rd St / 5th Avenue, 30 people injured. Most injuries were minor. While the motorman claimed to have passed out, the accident was likely the result of a "keyed-by" signal. December 12th, 1978: At 4:43pm, an IND derailment of R-10 cars at Columbus Circle injures 21. R-10 car 3333 destroyed. The wheels of the 7th car broke loose as the train left 59th Street heading downtown. The cause was blamed on "persons unknown" who tampered with a hand brake in the 6th car. $667,500 in damage occurred. July 4th and Labor Day Weekends, 1980: BU Elevated Cars used on Nostalgia Specials to the Rockaways. June 20th, 1986: First R-68A subway car begins service on the Brighton Line. November 19th, 1988: First TA auction. BRT car 1440 made available for sale at an opening bid of $3,500. December 11th, 1988: Major service changes take effect, including the opening of the Archer Ave subway. The changes are the most extensive since the Chrystie Street connection opened in 1967. December 18th, 1988: D train derails at 125th Street, 15 hurt. May 12th, 1989: All subway cars are graffiti free. Special thanks to Joe Raskin of New York City Transit for sharing notes and research suggestions with me for this second revision of the IND History. Copyright 1999, 2000 by Mark S. Feinman. Permission is granted to individuals to copy all or part for personal use, provided the copies are not sold for profit and this copyright notice is included.